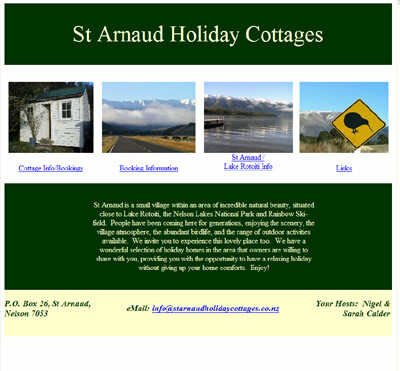 Accommodation in St Arnaud Nelson Lakes National Park. Nelson Lakes Motels in St Arnaud offer three types of accommodation; comfortable self contained Motel Units, two bedroom family Cottages and a modern 36 bed Travellers Lodge. All Alpine Lodge rooms (except Alpine Backpackers) include colour TV and in-house video, refrigerator, tea/coffee making facilities, direct dial phone system. We have a wonderful selection of holiday homes in the area that owners are willing to share with you, providing you with the opportunity to have a relaxing holiday without giving up your home comforts. 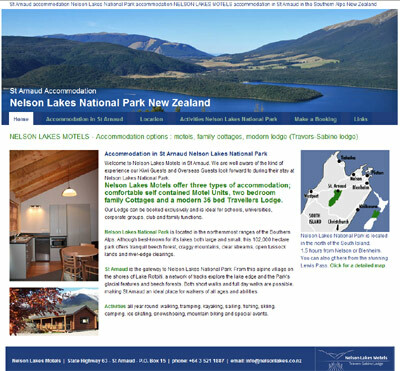 Nelson Lakes National Park-Based at Kerr Bay hamish can take you any hut destination around the Lake Rortoiti shores. Southern Wilderness specialises in innovative day and multi-day Gourmet Guided Walks through the three National Parks of the Nelson Tasman region. The Heaphy Track in Kahurangi National Park, The Coastal Track in Abel Tasman National Parkand the Travers Sabine Circuit in Nelson Lakes National Park are the flagship multi-day walks in the region. Tararua's Great New Zealand Walk. Hiking on exclusive walking tracks in the Wairarapa. Welcoming hospitality, spectacular native bush, farm scenery, historical logging tracks, comfortable cabins and delicious home cooked meals. Our great New Zealand walks have it all. Backcountry New Zealand Hikes unfolds awesome opportunities for adventure travel, hikes, hiking, tramping and walking, trekking, backpacking backcountry tracks, backcountry trails, hiking trails, photography in spectacular scenery in our national parks. Backcountry adventure travel is about experience and ensuring that our New Zealand destinations retain their natural character and cultural diversity for future generations to enjoy. Explore, experience and enjoy Lord of the Rings spectacular scenery throughout backcountry New Zealand. This site is a photo record of some of their recent tramping trips in New Zealand. It also has photos of holidays in New Zealand and overseas and also some family events. If you are interested in tramping and thinking of doing some of the trips shown here then these photos will show you the type of country you will be passing through. Get the most out of your hiking experiences! Whether you're just getting interested or you are an experienced long-distance backpacker you're bound to find something of interest here. If you want food that actually tastes like home cooking this is pretty close to the real thing, tasty and nutritious. Most varieties and they are all good.. especially Thai Red Curry or Tom Kha Gai. They provide great desserts! Last Resort was purpose built to enable visitors to the Karamea area to enjoy the huge potential of its natural attractions. Last Resort has also proved to be a unique place to escape the burden of stress-filled living. Situated in Karamea, in the sub-tropical far north west coast, a small community isolated from the rest of New Zealand by the mountains of Kahurangi National Park, the only road connection being the spectacular scenic drive over Karamea Bluff from Westport. A newly renovated, warm, friendly, family-run hostel. Located in the centre of Picton but just slightly away from the hustle & noise of the port. One of the smaller backpacker hostels in Picton but with the widest range of accommodation including lots of doubles/twins with their own ensuites and entrance ways, a motel style 'unit', dorms and standard doubles. 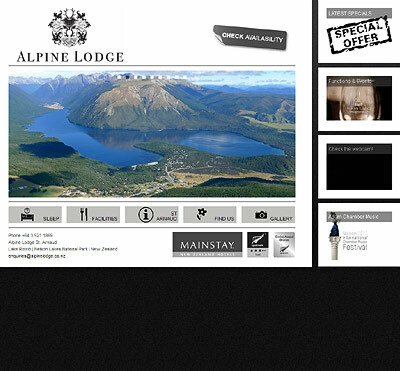 A helpful portal, directory and hiking style New Zealand website with lots more links.